Conducting independent, basic and applied research to benefit state and local institutions and personnel working in the justice and safety disciplines. Serving as a liaison between state and local public safety professionals and Federal agencies so that state and local needs are understood, and products and training are tailored to meet those needs. 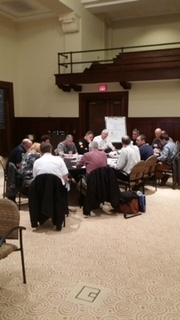 Working with other strategic partners and subject matter experts for collaborative problem-solving on a range of complex, critical justice and safety topics. Being outcome driven, ensuring that state and local institutions and personnel receive the tools they need as rapidly as possible, and that the information is easily accessible. All sponsored research is reviewed by the EKU Institutional Review Board (IRB) to ensure the protection of human subjects as well as subject to the EKU’s conflict of interest and financial disclosure policy. 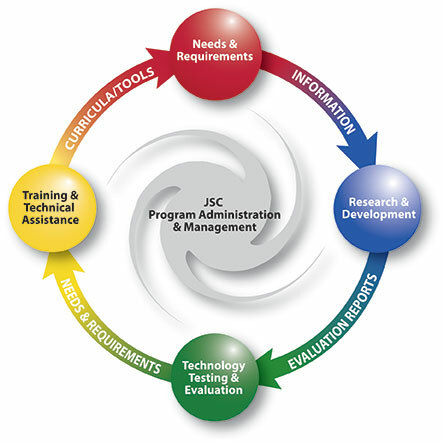 JSC research activities are guided by a defined process that is adaptable to any project, whether it has a technology, training, or social science research focus. One of the most important elements of the process is the practitioner-driven aspect. The JSC continuously engages practitioners in project activities to ensure outcomes are relevant, applicable, useful, and timely for the intended audience.